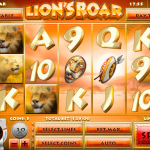 Lions Roar was released in 2014 by Rival. It is 5 reels and 50 paylines game set on an African Safari. It is true that you can find many games using the same Safari premise but this game is pretty new and sleek. A very good reason to play it already! The Lion Face is the Wild symbol in this game. It will help you complete any winning combination with a 2x multiplier when you win. There is one scatter in this game which is the Lion & Lioness symbol. 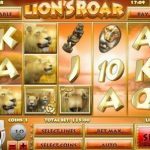 Landing 3, 4 or 5 will win you 10, 20 or 50 Free spins with a 2x multiplier for any win. On top of that if you land 3, 4 or 5 scatters during the Free Spins round you get even more free spins 3, 6, and 15 respectively. Like we wrote before this game is very sleek and gives you a very engaging experience. It is true that there isn’t a bonus round which is disappointing but you the free spin rounds and the wild really make it easier to win here and the winning ratio is quite good. We think you should try the next game set inside Leonardo Da Vinci’s workshop. 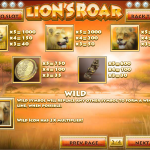 Try playing Leonardo’s Loot a 5 reel slot by Rival.